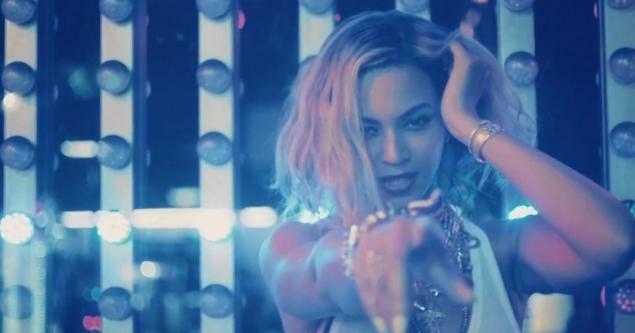 As for the content itself, Beyoncé’s music videos have a strong setting and narrative that represents the lyrics of the song. For example, “Pretty Hurts”, a song about society’s obsession with outer-beauty, she plays the role of a beauty queen, in which every part of her body (along with other contestants’) is critiqued by a panel of judges (most of the video is shot in black and white which sharply contrasts what we’ve come to know of beauty pageants), followed up by the powerful warlike, all-come-together battle sequence in “Superpower”, the touching “Blue” (a nod to Beyoncé’s daughter Blue Ivy, whom she shares with husband Jay-Z), and commencing with the up-beat “Grown Woman”, in which we see a young 6-year old and then a 12-year old Beyoncé lip-synching (or perhaps dubbing) the catchy lyrics of “I’m a grown woman, I can do whatever I want.” A nice juxtaposition there by watching a baby Queen B sing her now-relevant lyrics. The secret visual album: A pretty big feat if you think about the way music is carelessly leaked online today, from demos to full length albums finding their way onto music blogs and P2P torrents for anyone to download free of cost. Her team came up with a brilliant, well executed plan that has spurred two Billboard hits and sold three million copies within a month of being released. I, however, have wonder if Beyoncé is undermining the importance of either singles being released from an album or the importance of music videos by producing this visual album. At one point, music videos were reserved for promotion and exposure of an artist, awaiting plays on MTV. This also calls for inquisitions about the future of music and big name artist putting out their next release. I don’t think an up-and-coming singer could just as easily, at the stroke of midnight, magically post their brand new mastered studio album on iTunes and expect it to be a worldwide hit, but someone like Beyoncé, who has worked on new music since 2012 (after 4 barely hit the mark), this could be a path others of her stature could take in the future. Demi Lovato took a page from Beyoncé’s book and recorded mini-music videos that represented the songs performed on her Neon Lights Tour that was played on the stage screen. Others may reject this idea of visually inspired music. For example, Lady Gaga has unceremoniously taken the anti-Beyoncé route but choosing not to release a music video for top 15 hit “Do What U Want” from the album ARTPOP, claiming she was facing unfair time constraints that deterred her creative process. Whether musicians follow her lead in the future, i.e. visually painting an entire album, I believe it is just another way we can perceive music and most importantly, this could give the listener a second chance to fully understand the meaning of each song. Hey, I love the topic. I thought it was really interesting that Beyonce chose this route, but then I thought about how much artists like Beyonce reach their fans through social media and youtube on a daily basis and it kind of made sense. One of the easiest ways to reach young adult audiences is with visuals nowadays, especially when it comes to the Queen Bey. And by doing it on her own as a surprise there was no “leak” and forced many to actually buy the cd and support the artist. Of course, I’m sure a move like this requires a level of financial ability, but I’d be very interested to see other established artists get creative and produce albums like this. Though I personally don’t care for music videos, I can’t deny the impact they have on the consumption of music, especially through Youtube. I can’t imagine Gangnam Style would have had the unprecedented amount of success it had without the accompanying music video, goofy horse dance and all. And with VEVO channels available for many artists on Youtube, where you can listen to music for free (with ads), I think the push for video makes sense in reaching the widest possible audience. I really like the combination of visuals with music. Since we just had Neil Gaiman on campus it reminds me of his collaboration with photographer Kyle Cassidy, and Amanda Palmer for her album Who Killed Amanda Palmer (which was also supposed to have a video for each song, but she failed in doing that). I honestly I had no idea that Beyonce released a visual album, but I’m going to go check it out! Your point about her being Beyonce most certainly enables her to have success without any marketing. She deserves major props for being able to keep the whole project a secret until its release. Personally, I have not seen any of the music videos for her songs. Regardless the amount of what an artist means can get lost in the lyrics, so the use of a music video with each song allows for meaning to be feed down the viewers throats. They no longer get to decide what the song is about. Our mash ups on the other hand allows our audience to make up their own meaning, and although I haven’t watched any of Beyonce’s videos, I can image they do not give much room for interpretations.